This elegant, yet relaxed, bedroom is the grand master of a single-floor, waterfront apartment. The quiet retreat from sun-filled, beach living. Once the permanent home of an art-loving couple with an eye for timeless classics – now scantily clad with statement artworks and enduring furniture. Our task – choose the keepers, re-arrange them to the best location, then fill the gaps to create a ‘lived-in and loved’ vibe. The master bedroom was empty, save for a bed and cane chair. Our first choice was an original painting – selected for its ethereal nature, dimensions that elongate the wide wall and colours that connect to our furniture. 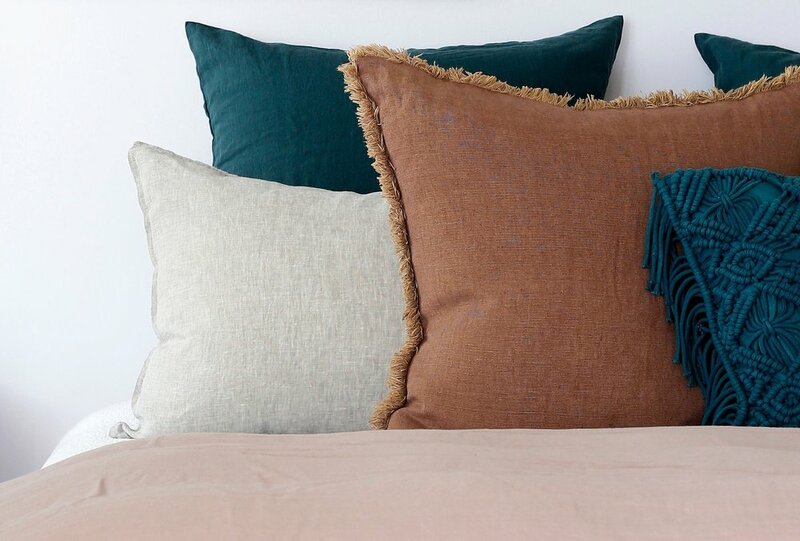 It informed our room-palette of mauve, emerald and terracotta. The space was brightened by a re-paint of walls and ceiling, in Resene Black White. 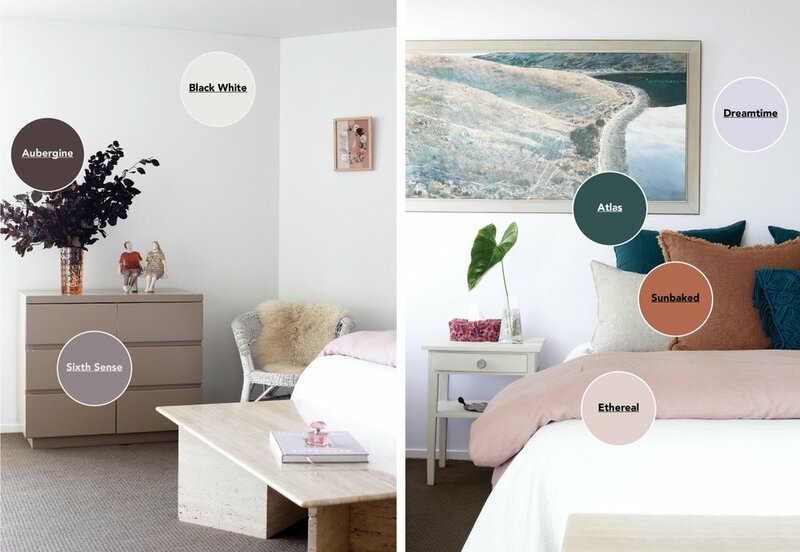 The three-quarter wall – dividing the sleeping area from a private dressing room – was given its own identity with a repaint in Resene Dreamtime. The marble coffee table stretches the bed into the room and provides a place for general bedroom ‘flotsam and jetsam’ – or in this case, a book of dreamy David Hicks interiors in the perfect shade of mauve, and a translucent perfume bottle mirroring the the vase beyond – all part of telling a story and leading your eye around the room. 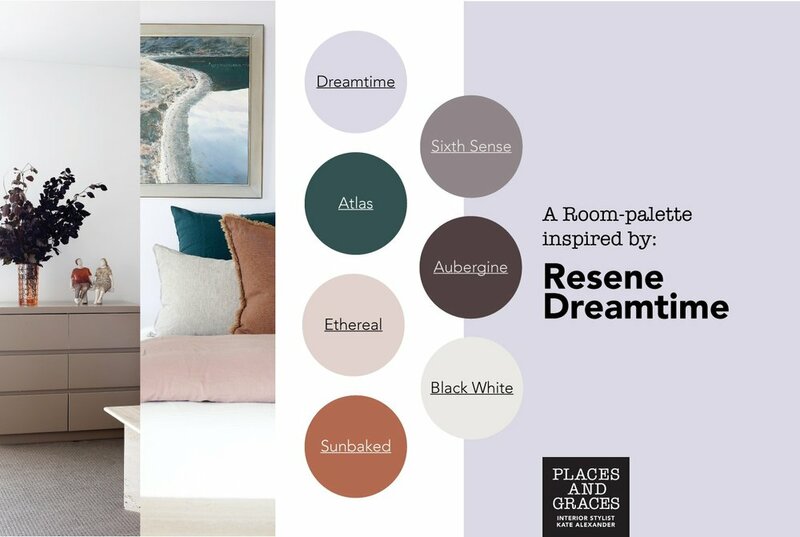 For your own elegant bedroom refresh like this room above, follow our room-palette inspired by the delicate, Resene Dreamtime.